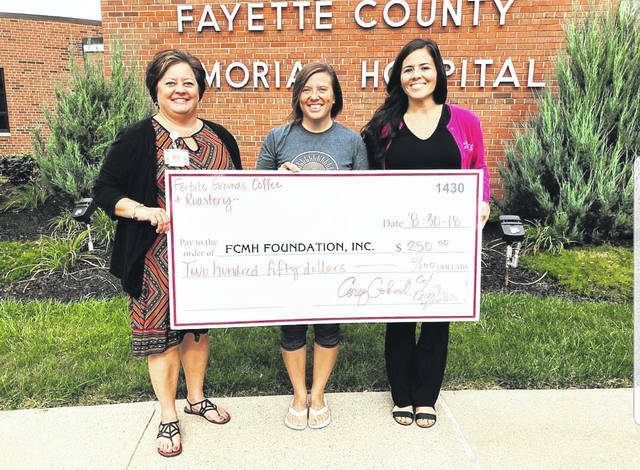 Fertile Grounds Coffee and Roastery donated a portion of summer coffee sales to the emergency department remodeling fund of the Fayette County Memorial Hospital Foundation. Pictured from left, Whitney Gentry, FCMH Foundation Director, Cori Cockerill, owner of Fertile Grounds and Stephanie Campbell-Dunham, Foundation Coordinator. This is the second year Cockerill has travelled to the FMCH campus for summer coffee sales. “We really appreciate Cori and her support of the FCMH Foundation and the community,” said Gentry. https://www.recordherald.com/wp-content/uploads/sites/27/2018/08/web1_Screenshot_20180831-131615_Instagram.jpgFertile Grounds Coffee and Roastery donated a portion of summer coffee sales to the emergency department remodeling fund of the Fayette County Memorial Hospital Foundation. Pictured from left, Whitney Gentry, FCMH Foundation Director, Cori Cockerill, owner of Fertile Grounds and Stephanie Campbell-Dunham, Foundation Coordinator. This is the second year Cockerill has travelled to the FMCH campus for summer coffee sales. “We really appreciate Cori and her support of the FCMH Foundation and the community,” said Gentry.